Original Editors - Emma Bewick, James Greenwood andMatthew Bailey. Further adding to the knowledge of the Spondylolsis physiopedia page, this Wiki page aims to provide readers with a background understanding of spondylolysis, why the young athletic population are more at risk and give an insight into the different management options which are available. We will discuss in detail the different treatment options using pre-existing evidence, with a main focus on the efficacy of each treatment option in returning the athlete to sport. Spondylolysis is defined as a bony defect within the pars interarticularis of the vertebral arch. It presents as a weakness or fracture at this point. The vast majority of spondylolitic defects are seen at level L5 (85-95%), with level L4 being the second most likely to be affected. The higher levels of the lumbar spine are rarely affected. The degree of slip can be graded using the Meyerding scale. A first degree injury involves slippage of 0-25% of the diameter. A second degree slip is 25-50% and a third degree is 50-75%. This can progress to a fourth degree slippage which would be a 75-100% diameter displacement or the vertebrae can displace by more than 100% producing a grade 5 slip. It is estimated that spondylolysis is present in 6 – 8% of the general population. The incidence has seen to be increased (47%) within the young athletic population. There is a particular increased risk in sports which subject athletes to repetitive hyperextension and rotation across the lumbar spine. Gymnasts, in particular, have been found to be more likely than their non athletic peers to develop a spondylolysis. Research has also found there to be an increased risk for cricket bowlers. The exact cause of spondylolysis currently remains unclear, with many factors thought to contribute to its development. It has been described as hereditary, or acquired as a result of repetitive stress to the lumbar spine. In the young athlete the spine is still growing, giving rise to numerous ossification centres which leave points of weakness in the spine. This leaves young athletes, in particular those exposed to repetitive hyperextension and rotation of the lumbar spine, susceptible to injury and the development of spondylolysis. Majority of the cases are asymptomatic. For a list of differential diagnoses click here. No optimal tool for diagnosing spondylolysis has been identified. A combination of various methods has been found to be the most reliable. However early diagnosis has been found to increase the likelihood of healing. There are a variety of imaging tools that may be used to establish a spondylolysis. 35% of young athletes will have a bone scan if they have a history of back pack for 6 weeks or more. Masci et al. found that the one-legged hyperextension manoeuvre was neither specific nor sensitive in detecting spondylolysis. The manoeuvre may detect an abnormality in the posterior structures but should not be relied upon to make the diagnosis. • Can be take in AP, PA, lateral or oblique plane. • Oblique x-rays are more likely to show a spondylolysis defect as the “Scottie dog” will appear to have a broken neck or a collar as seen in the image below. 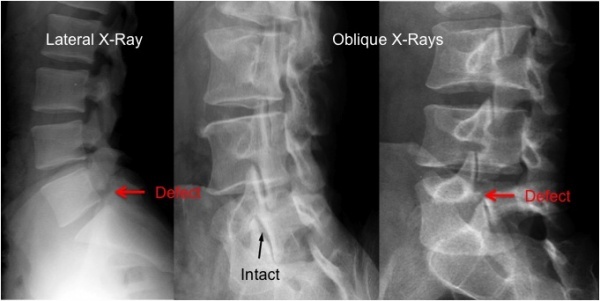 However, some defects are more visable in a 30 degree plane and others are more easily seen in a 60 degree plane therefore oblique x-rays are not used very often due to the lack of correlation between pain and an established spondylolysis. • Multiple x-rays taken in cross sections of the body to create virtual slices through a anatomical section. • CT scans have been found to be more sensitive than plain radiographs. • Congeni et al. found that CT scans play an important role in guiding the treatment of a spondylolysis. CT scans are able to identify the type of fracture and establish whether there is an acute of chronic lesion. • Nuclear medicine in injected into the patient. Low doses of radioactive gamma rays are used as they are able to attach themselves to the body’s cells. Gamma cameras produce multiple 2D images that can then be used to create a 3D image on a computer. • It can monitor biological activity such as blood flow. • Useful in identifying a bony lesion. • Congeni et al. advised to use SPECT in conjunction with CT scans to make a diagnosis of spondylolysis and to guide treatment as there was a 15% false-positive rate in SPECT scans. • The magnets cause the protons of cells to line up whilst the radio waves knock the protons out of place. Different tissues realign at different speeds and as they do, they emit a radio wave allowing a picture to be created differentiating soft tissues. • MRI can be used to identify varying pathologies associated with low back pain (See Differential Diagnosis section) especially if there is soft tissue damage. • MRI has been advocated as an alternative to CT and SPECT and is often considered more appealing because of its non-ionising properties. There is controversy amongst the literature as to which imaging method is preferential for diagnosing spondylolysis. Many papers suggest bone scintigraphy using SPECT to be the gold standard followed by a CT scan. CT scans are able to distinguish between an acute or chronic spondylolysis and the type of fracture, providing important information with regards to making a treatment plan. MRI is commonly used and often favoured as this imaging does not use ionising radiation. However, there is little evidence to support its sensitivity in diagnosing spondylolysis. Masci et al. found MRI to have no statistical difference with the CT findings. It was reported that 47% of low back pain in young athletes is diagnosed as spondylolysis (Micheli & Wood, 1995; McCleary & Congeni, 2007). High incidence rates of spondylolysis have been reported in a number of sports including cricket, gymnastics, tennis and weightlifting. Therefore this section will briefly touch upon some of these sports and why these young athletes are more predisposed to this condition. A 2002 study observed bowlers over 6 months; they found that 10% of spin bowlers and 12% of fast bowlers developed LBP over the season. 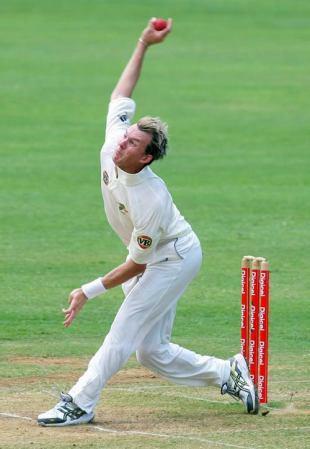 The action of bowling in cricket involves rotation and side flexion of the spine at high speeds. During the delivery phase the bowler is performing these movements to the best of their ability in order to gain as much speed, spin and strength to the ball. As the front leg comes forward to deliver the ball, forces travelling through the leg and up into the lumbar spine can be 3-9 times that of our body weight. Adding to this that the bowler will have to bowl 6 balls every over for as many as 9-10 overs. It is not hard to see why this repetitive and powerful motion may lead to a spondylolysis. It is common for these athletes to report non-specific low back pain, which often feels like a dull ache but can become a sharper pain during their sporting activity. Treatment for this population can be difficult as it often involves rest in the early stages, this can be as long as 8 months in some cases. However it is then important to address factors such as muscle imbalance, core stability, flexibility and pelvic control. Although they will be unable to bowl during this period of time they can continue to maintain cardiovascular fitness – such as swimming and cycling – as long as they are symptom free. Most importantly treatment must be sport specific especially in the later stages of rehab. Example: When focusing on core stability the player is standing on leg balancing on a soft cushion or trampette while performing the bowling action. This is later progressed by attaching the ball to a theraband, which is tied to a fixed point behind the player. (Some of the information above was taken from a 2006 article by Caryl Becker in Sport Ex magazine). It was reported in a paper published in 2000  that the incidence rate in gymnasts was between 15-20%, this is much higher than the general population. Once again it is not hard to understand why this would be due to the high physical demands of the sport, the hours of daily training and repetitive forces. One case study that focused on female gymnasts in 1976  looked at 100 gymnasts and found that 11 had spondylolysis and 6 of these had progressed to a spondylolysthesis. The girls described the pain as chronic, dull aching and found it was particularly aggravated when hyperextended. This is another high intensity sport, which involves increased forces. The incidence rate has been reported to be between 30.7-44%. Studies believe there is a clear relationship between this condition and the stress of lifting. Stone et al  described the actions involved in weightlifting and discussed the excessive impact forces seen during the catching phase of the bar. They also noted that these stress and shear forces are greatly increased through the joints when the athlete completes the jump onto one leg. Enabling patients to return to sport is at the forefront of any treatment plan for an athlete following injury. Each athlete must be considered individually in terms of his/her symptoms, functional limitations, their sport and level of participation, as well as any other characteristics which may influence their treatment. The optimal treatment for athletes with spondylolysis is still widely debated within the literature, with there being a current lack of controlled studies to have investigated the management. However it is generally accepted that the young athlete with spondylolysis should initially be managed conservatively. Surgical management is generally only considered when all conservative methods have failed, with only an estimated 9-15% of all symptomatic cases undergoing surgery. Physiotherapy with these patients aims to restore range of motion, stabilise and strengthen the spine, and to reduce pain. The use and effectiveness of lumbosacral braces is still debated within the literature. Use of a brace is supposed to allow the healing of the bony defect in the pars interarticularis, reducing the athlete’s pain and allowing a return to sport. However, Watkins states that it is yet to be demonstrated statistically to enhance the healing of a spondylolitic defect. Previous studies though have found the use of bracing to be effective in allowing the return to sport for an athlete. Both thes studies though, did include a period of exercise therapy following the use of the brace, prior to a return to sport. Common physical therapy used in the rehabilitation of spondylolysis in young athletes is concentrated strengthening of the core stability muscles; transverse abdominus, multifidus and quadrates lumborum. Watkins describes how strengthening these core stability muscles will provide biomechnically sound spinal function to allow a return to sport. In order for this to be achieved though it is important that core stability strengthening is progressed into functional, specific exercises for each athlete following the initial period of retraining/activating the core muscles. The use of specific core strengthening exercises with spondylolysis patients has been shown to significantly reduce pain and enhance functional ability when compared to other conservative treatments. The use of electrical stimulation in the conservative treatment has been investigated with some researchers believing that it's use may help reduce pain and allow the defect to heal, if other traditional methods of treatment have failed. However the research in this area is very limited and of poor quality, leading to its dismissal by many authors. The use of surgery for spondylolysis within the young athletic population is seen as a last resort option, after all the methods of conservative treatment fail. There are vast arrays of surgical techniques which can be performed, but most commonly either a screw or wire fixation are the preferred methods. As like the conservative treatment methods, surgical treatment of spondylolysis with the young athletic population has been shown to be very effective in returning athletes to their sport. In fact one study demonstrated a 100% success rate for surgery with every athlete included in the study returning to their sport following surgery. However, in comparison to the conservative approach, surgical treatment did require athletes to have an extended period away from their sport. One study showed an average lay off time of 7 months following surgical treatment. Due the nature of surgery, athletes still require a period of rehabilitation postoperatively. This post operative treatment will include many of the exercises used in the conservative approach, targeting the strengthening of core stability muscles. Sports injuries can have major impacts on an athlete’s career. Some injuries can even terminate their future ability to perform. Psychological issues may impact the rehabilitation of an injured athlete. Chronic injuries have a bigger effect than acute injuries and people with low back pain scored higher for all psychological features, compared with the controls, on the Symptom Checklist 90. It is therefore important that an athlete’s rehabilitation programme includes a component that addresses the psychological factors. This will in turn aid physical recovery, prevent re-injury, promote return to sport and increase adherence to rehabilitation. The biopsychosocial model proposed by Brewer et al. 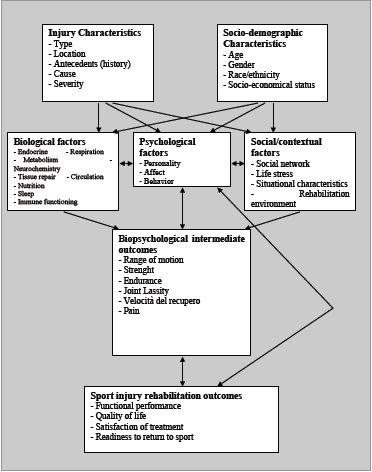 shows how psychological and social factors have an impact on injury rehabilitation. The model was designed to widen the focus of rehabilitation. The model shows how characteristics of injury, sociodemographic factors, biological factors, immediate biological outcomes, social factors and psychological factors all affect the sport rehabilitation outcomes. With psychological factors in the centre of the model, this suggests that all other factors have an influence on the psychological factors. It is therefore important to address the psychological factors in order to affect the sport rehabilitation outcome. Emotional distress and age have been found to have a negative impact on rehabilitation. Frustration and anger were two of the emotions most frequently reported by athletes recovering from a sports injury. Confusion, fear and depression were other psychological factors that injured athletes are more at risk of feeling. For athletes, their sport becomes a major part of their identity. Therefore, injury can have a great impact on their mental well-being. Fear can have a huge impact on recovery and return to sport. Many athletes become fearful on re-injury leading to them not training at full intensity. This may also have an impact on adherence to rehabilitation. However, emotional response to injury varies amongst athletes: not all athletes suffer from emotional distress post-injury. How an athlete reacts to injury may depend on their mental well-being prior to the injury. Self-efficacy, self-esteem, confidence and motivation prior to injury are some factors in particular that can be used to determine an athlete’s reaction post-injury. Age and gender have also been found to affect an athlete’s response to injury rehabilitation. The age of the athlete at the time of injury showed variations in their emotional response. This is thought to be as a result of varying degrees of exposure to different social influences, emotional responses, motivations and self-perceptions. Adolescent athletes who showed high signs of depressive symptoms, decreased over time with good social support. “Social variables have also been linked to cognitive, emotional, behavioural and physical responses to sport injury.” It is therefore important to provide social support in the following domains: listening support, emotional support, emotional challenge, task appreciation, task challenge, reality confirmation, material assistance and personal assistance. Schwab Reese, Pittsinger & Yang found these various interventions to be beneficial to an athlete’s rehabilitation post-injury. This review included seven studies with athlete’s ranging from 17 to 50 years old with various injuries but not back pain or spondylolysis in particular. This account was taken from a physiotherapist working in an outpatients setting. The case study describes a past patient that she assessed and treated. A 15 year old keen cricketer and golfer presented with acute right-sided low back pain which had come on suddenly after playing cricket at the weekend; at the time he was unable to run and in fact felt considerable pain walking. During the week before this he had been on a golfing holiday playing a round a day and on some days 2 rounds. He had experienced a dull pain three weeks before and it was always related to cricket. In fact, this young boy recalled some twinges of pain in the previous school term while playing in the nets. He was a fast bowler. This boy was in good health with no previous episodes of back pain. He had recently had a growth spurt. On examination there was significant right-sided muscle spasm on lumber movements. There was pain during flexion and right side flexion with an excessive amount of movement available. Right hip flexion was painful and a right straight leg raise resulted in low back pain. 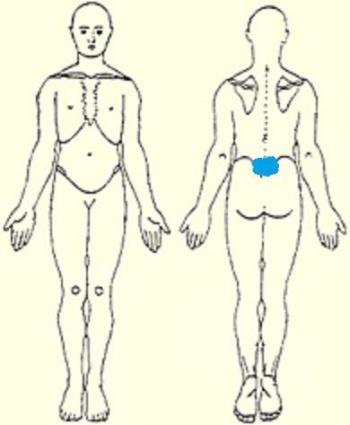 On palpation there was pain and resistance at L4/5 and L5/S1. During the initial treatment manual therapy was used to settle the acute pain and spasm. The patient reported that this eased the pain until he then went and picked up cricket balls from off the floor. He was referred on for further investigations at this point. An x-ray, including oblique views, showed evidence of a spondylolysthesis of L5/S1. Therefore An MRI was arranged. This clearly showed a bilateral pars interarticularis defect. However there was no forward displacement of L5. The patient was then instructed to completely rest for the next four months, he was referred back for physiotherapy at this point. Now, on examination, his movements were pain-free. On palpation there was some mild stiffness in the low lumbar spine but the hip and straight leg raise showed no symptoms. Treatment at this point included gentle stability and strengthening exercises. For example he was encouraged to stretch his hamstrings, use breathing control and begin lower transverse abdominal exercises: spine curls in lying, bridging exercises and stability exercises whilst moving the legs. These were later progressed onto the Swiss Ball combined with more functional exercises in standing aiming towards cricket related exercises. For example using the overhead movement of the arm taking care not to over extend the lumbar spine. Ensuring there wasn't a hinge point into lumber extension and that rotation was used. It was also worth checking he had enough available shoulder movement. Kamal is a 21 year old, cricket player, playing at a competitive University level. He was diagnosed with Spondylolysis 5 years ago. and was treated conservatively with physiotherapy. In his testimony, made by ourselves, Kamal talks about his experiences, treatment, and emotional well being, as a young athlete with spondylolsis. Direct repair of spondylolytic defects in young competitive athletes Reitman and Esses Spine Journal – 2002 To review outcome, specifically return to sport, in a group of competitive athletes after direct pars repair for symptomatic spondylolysis Retrospective case series of a single surgeoneries of four athletes who underwent direct pars repair over an 18-month period All participants were able to return to their presymptomatic level of activity with no restriction. One had periodic low back pain that required nonsteroidal anti-inflammatory medicine as needed. The others were entirely asymptomatic. Small sample size (only 4 participants) with the same surgeon. Evaluation of specific stabilizing exercise in the treatment of chronic low back pain with radiologic diagnosis of spondylolysis or spondylolisthesis O’Sullivan, Phyty, Tworney and Allison Spine Journal – 1997 To determine the efficacy of a specific exercise intervention in the treatment of patients with chronic low back pain and a radiologic diagnosis of spondylolysis or spondylolisthesis A randomized, controlled trial, test--retest design//	Forty-four patients with this condition. Either randomly assigned to one of 2 groups. The first group underwent a 10-week specific exercise treatment program involving the specific training of the deep abdominal muscles, with co-activation of the lumbar multifidus proximal to the pars defects. The activation of these muscles was incorporated into previously aggravating static postures and functional tasks. The control group underwent treatment as directed by their treating practitione The specific exercise group showed a statistically significant reduction in pain intensity and functional disability levels, which was maintained at a 30-month follow-up. The control group showed no significant change in these parameters after intervention or at follow-up. Lack of detail regarding the control group and the exercise and interventions that they received. Also looked at spondylolthesis patients as well when this page is just looking at spondylolysis. Returning athletes with severe low back pain and spondylolysis to original sporting activities with conservative treatment. Scandinavian journal of medicine and science in sport., 2004 Iwamoto,J1, Takeda T, and Wakano K The purpose of this study was to clarify the efficacy of conservative treatment in athletes with severe low back pain and spondylolysis, especially focusing on returning to original sporting activities A randomized, controlled trial//	One hundred and four athletes (96 males and eight females) over an 11 year period. mean age of the patients was 20.7 years. All conservatively treated with activity restriction and antilordotic lumbosacral bracing After their low back pain was markedly reduced, the brace was removed and then individual training to return to the original sporting activities was starte Thirty-five patients (87.5%) could return to their original sporting activities in an average of 5.4 months (range: 1.0-11.5 months) after the onset of treatment, and could continue the activities for at least 6 months despite non-bony union. These results suggest that the outcome of conservative treatment with activity restriction and bracing appears to be satisfactory in controlling symptoms and returning to original sporting activities Mainly males. 940-946 To establish whether the one legged hyperextension test is specific and sensitive in diagnosing spondylolysis in order to be used as a diagnostic tool. Back pain in young athletes Micheli, LJ. & Wood R Archives of Pediatrics and Adolescent Medicine. 1995 To determine any differences between the causes of LBP in young athletes and adult population. Retrospective randomized case comparison study. 100 athletes 12-18yrs. 100 adults 21-77. LBP 47% of adolescents had spondylolysis. •	5% of adults Older Study. 11 of the 100 had spondylolysis. •	6 of these were 1st degree spondylolysthesis. No clear aim of objective was given. •	A very old study. •	No clear study design was mentioned. Guillodo, Y. Botton, E. Saraux, A. Le Goff, P Spine. 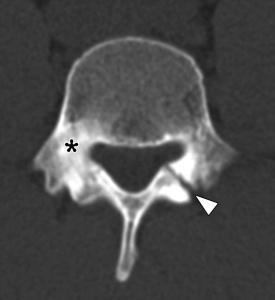 2000 To present a fracture of the right lumbar pedicle in a female gymnast A case Report. Female gymnast (born in 1983) who trains 15 hours a week. From 1994 to 1997 she underwent clinical examination and lumbar radiographs. Reports a 15-20% incidence of spondylolysis in gymnasts. •	There are inconsistencies between radiographs and observations. •	Spontaneous consolidation of this fracture occurred despite continuing with gymnastics. No reference used for the incidence rate. •	A case report: therefore still has a very subjective point of view from the subject. Studies of Spondylolysis found among weightlifters. Kotani, PT. Ichikawa, N. Wakabayashi, W British Journal of Sports Medicine. 1971. To determine if there is a relationship between spondylolysis and the motion of lifting a weight Case report. 26 male weightlifters aged 18 to 24 years. 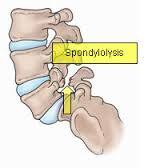 8 cases of spondylolysis were found = 30.7%. •	Found more commonly in those who had been taking part for 4yrs + Small sample size. Comparing Injuries in spin bowlers with fast bowlers in young cricketers. Gregory, P. Batt, M. Wallace, W Clinical Journal of Sports Medicine. 2002. To compare the incidence and anatomical distribution of injuries in fast and spin bowlers. prospective cohort study. 112 young male bowlers; aged 9 to 21. 42 spin bowlers and 70 fast. Telephone questionnaire every 6 weeks for 6 months. Incidence of injury in fast = 0.165/1000 balls bowled. • 17.6% were LBP injuries. • 10% of fast and 12% of spin bowlers developed LBP over the season. Injuries were self-reported and not examined. ↑ 3.0 3.1 Standaert C.J., Herring S.A., Cole A.J., and Stratton S.A. (2003). The lumbar spine and sports. The low back pain handbook, 385-404. ↑ 7.0 7.1 7.2 Micheli, L. J. and Wood, R. (1995). Back pain in young athletes: significant differences from adults in causes and patterns. Archives of pediatrics & adolescent medicine. 149(1): 15-18. ↑ 8.0 8.1 Iwamoto, J., Sato, Y., Takeda, T. and Matsumoto, H. (2010). Return to sports activity by athletes after treatment of spondylolysis. World journal of orthopedics, 1(1), 26. ↑ 9.0 9.1 9.2 Jackson, D. W., Wiltse, L. L.and Cirincione, R. J. (1976). Spondylolysis in the female gymnast. Clinical orthopaedics and related research. 117: 68-73. ↑ Hardcastle P., Annear P., Foster D.H., Chakera T.M., McCormick C., Khangure, M. and Burnett, A. Spinal abnormalities in young fast bowlers. Journal of Bone & Joint Surgery, British Volume. 1992: 74(3); 421-425. ↑ 11.0 11.1 McCleary, M. D. and Congeni, J. A. (2007). Current concepts in the diagnosis and treatment of spondylolysis in young athletes. Current sports medicine reports. 6(1): 62-66. ↑ Haun D.W. and Kettner, N. W. Spondylolysis and spondylolisthesis: a narrative review of etiology, diagnosis, and conservative management. Journal of chiropractic medicine 2006: 4(4); 206-217. ↑ 19.0 19.1 McCleary, M. D. and Congeni, J. A. (2007). Current concepts in the diagnosis and treatment of spondylolysis in young athletes. Current sports medicine reports. 6(1): 62-66. ↑ 22.0 22.1 Gregory, P. L., Batt, M. E., & Wallace, W. A. (2002). Comparing injuries of spin bowling with fast bowling in young cricketers. Clinical Journal of Sport Medicine.12(2):107-112. ↑ Becker, C. (2006) Lumbar Spondylolysis: Diagnosis and Rehabilitation. Sport Ex Journal. 30:6-9. ↑ 24.0 24.1 Guillodo, Y., Botton, E., Saraux, A., & Le Goff, P. (2000). Contralateral spondylolysis and fracture of the lumbar pedicle in an elite female gymnast: a case report. Spine. 25(19): 2541-2543. ↑ Kruse, D. and Lemmen, B. (2009). Spine injuries in the sport of gymnastics. Current sports medicine reports. 8(1): 20-28. ↑ 26.0 26.1 Kotani, P. T., Ichikawa, N., Wakabayashi, W., Yoshii, T., & Koshimune, M. (1971). Studies of spondylolysis found among weightlifters. British journal of sports medicine. 6(1): 4. ↑ 27.0 27.1 Stone, M. H., Fry, A. C., Ritchie, M., Stoessel-Ross, L., & Marsit, J. L. (1994). 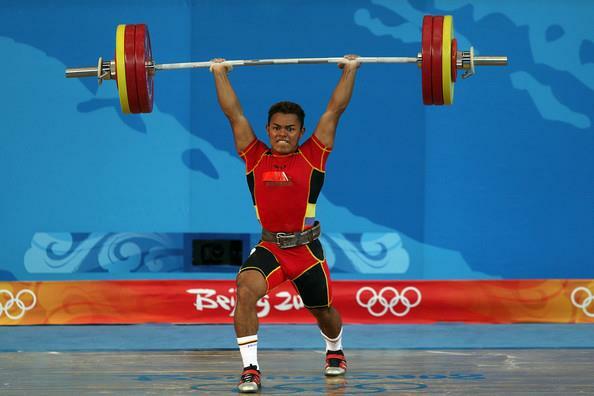 Injury potential and safety aspects of weightlifting movements. Strength and Conditioning Journal. 16(3): 15-21. ↑ McNeely, M. L., Torrance, G. and Magee, D. J. (2003). A systematic review of physiotherapy for spondylolysis and spondylolisthesis. Manual therapy, 8(2), 80-91. ↑ 31.0 31.1 31.2 Iwamoto, J., Takeda, T., & Wakano, K. (2004). Returning athletes with severe low back pain and spondylolysis to original sporting activities with conservative treatment. Scandinavian journal of medicine & science in sports, 14(6), 346-351. ↑ 32.0 32.1 Sys, J., Michielsen, J., Bracke, P., Martens, M., & Verstreken, J. (2001). Nonoperative treatment of active spondylolysis in elite athletes with normal X-ray findings: literature review and results of conservative treatment. European Spine Journal, 10(6), 498-504. ↑ 33.0 33.1 33.2 O'Sullivan P.B., Phyty G.D.M., Twomey L.T. and Allison G.T. Evaluation of specific stabilizing exercise in the treatment of chronic low back pain with radiologic diagnosis of spondylolysis or spondylolisthesis. Spine. 1997: 22(24); 2959-2967. ↑ 34.0 34.1 34.2 Drazin D., Shirzadi A., Jeswani S., Ching H., Rosner J., Rasouli A. et al. Direct surgical repair of spondylolysis in athletes: indications, techniques, and outcomes. Neurosurgical focus. 2011: 31(5); E9. ↑ 35.0 35.1 35.2 35.3 Reitman, C. A. and Esses, S. I. (2002). Direct repair of spondylolytic defects in young competitive athletes. The Spine Journal, 2(2), 142-144. ↑ 36.0 36.1 36.2 Debnath, U. K., Freeman, B. J. C., Gregory, P., de la Harpe, D., Kerslake, R. W. and Webb, J. K. (2003). Clinical outcome and return to sport after the surgical treatment of spondylolysis in young athletes. Journal of Bone & Joint Surgery, British Volume, 85(2), 244-249. ↑ Brewer, BW., Anderson, MB. & Van Raalte, JI. (2002) Psychological Aspects of Sport Injury Rehabilitation: Toward a Biopsychosocial Approach Medical and Psychological Aspects of Sport and Exercise 41-54 D. Mostofsky and L. Zaichkowsky (Eds), 2002 Morgantown. WV Fitness Information Technology. ↑ 40.0 40.1 40.2 Tenenbaum, G. & Eklund, RC. (2007) Handbook of Sport Psychology. Psychology. John Wiley & Sons Inc. 3rd Edition. Published in New Jersey, Canada.